My youngest child started Kindergarten this year. He also turned six the first of this month. If you’re a parent, you know what it’s like to see your littlest being not so little anymore. You are torn between being so proud of their accomplishments and teary eyed because the last little baby is gone. For me, that’s a definite gone. No more babies here. I’m 50 and at this age, I can’t imagine starting over, no matter how tempting it may be. As it is, when Joshie (also known as “Boo”, “Boo Berry”, Boo-Boo”, “Boo Of Boo-ness”, “Joshie Of Joshie-ness” and “Berry Of Boo-ness”…. hey, what family doesn’t have weird endearments for each other? Quit laughing at us. 😛 ) graduates high school, I’ll be in my 60’s! YIKES! When Josh started school, one of the first things he “learned” was how to sit in class (a way I don’t agree with by the way because it promotes back pain and bad posture, but that’s neither here nor there right now 😀 ). It’s called “Criss Cross Applesauce”. My older kids are quite a bit older than he is (think mostly grown and married) and I don’t recall them sitting that way or certainly not having what Urban Dictionary calls “the pansy name for sitting cross legged” for it, lol. So now any time I use applesauce in any way, that phrase pops into my head. That is though, preferable to what used to pop into my head- “pork chops and apppppleeesauceeee” from an old Brady Bunch episode. Yes, yes I am old, thankyouverymuch. Preheat oven to 350 degrees. Spray two 8 inch loaf pans with a flour/oil baking spray; that or grease and flour the pans. In a medium bowl, whisk to combine the flour, baking powder and baking soda, salt and spices. In a large bowl, cream together the butter and brown sugar for about 4 minutes, scraping the bowl as needed. Add in the eggs, beating well. Add in the applesauce and vanilla, beating on low speed (this will splatter otherwise) until well combined. Add in the flour mixture and either on low speed with the mixer or using a sturdy wooden spoon, combine until mixture is just combined. A few small lumps are fine, just no apparent floury areas. Stir in the raisins and walnuts. Divide between the two prepared pans. Sprinkle the cinnamon sugar mixture over the top of the loaves, gently pressing down. If you don’t use it all, just store it in a small container. It’s great on toast or even in coffee. Bake at 350 for about 60 minutes or until a skewer inserted in the middle comes out clean. Let cool in the pan for ten minutes then carefully invert onto a rack to finish cooling. You WILL lose some of the topping. Just scoop it up and sprinkle it back on the bread. This entry was posted in Apples, Breakfast, Easy, Fruits, Quick Breads and tagged applesauce, breakfast, easy, quick bread, snack by Janet. Bookmark the permalink. This bread looks delicious! 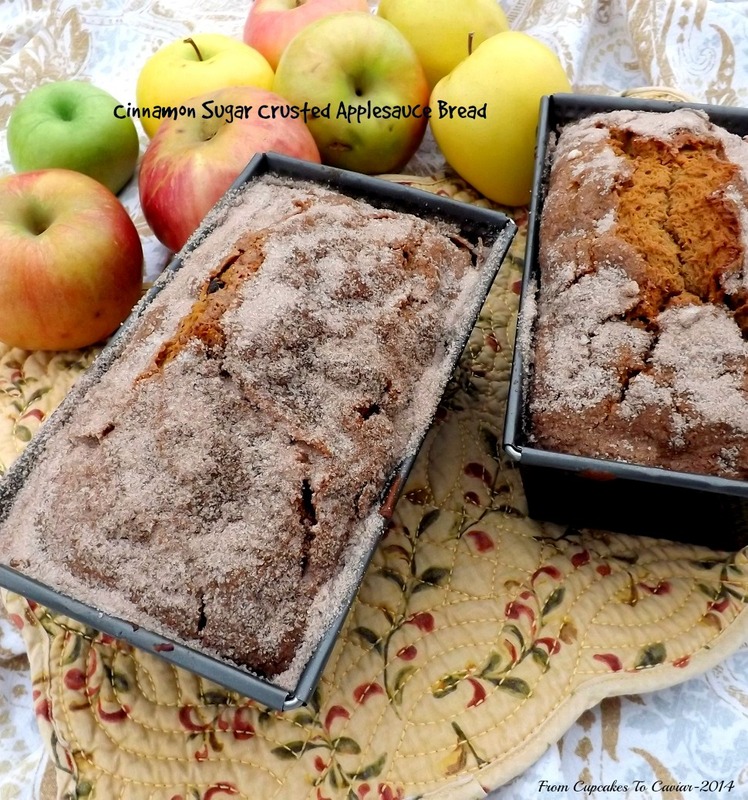 I am a sucker for applesauce bread especially when it has all those wonderful spices!! And that cinnamon sugar topping?! Yeah, I would have to guard the loaf to keep my husband from eating the tops off all the slices. No, seriously, he does that. Horrible! Pinned! One of my sons is also guilty of stealing off the crunchy tops of breads and pound cakes lol. awwww how sweet!! Your lil man is growing up!! and oooh I LOVE this bread-that cinnamon sugar crusted on top is especially tempting!